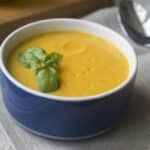 Learn how to make a creamy and delicious vegan butternut squash soup that has a few surprising but harmonious flavors in it, including coconut milk and basil. Recently I went on a health retreat. The food served there was meant to be healthy and vegan and I therefore went with no expectations other than healthy vegan food. Did I ever get a bonus when the meals turned out to be beautiful, intricately flavored and yet simple, and so so delicious. I learned that the retreat is Ayurvedic and uses a lot of the ingredients listed here to make vibrant, amazing dishes. I began immediately picking the brains of all the wonderful cooks employed at the retreat. 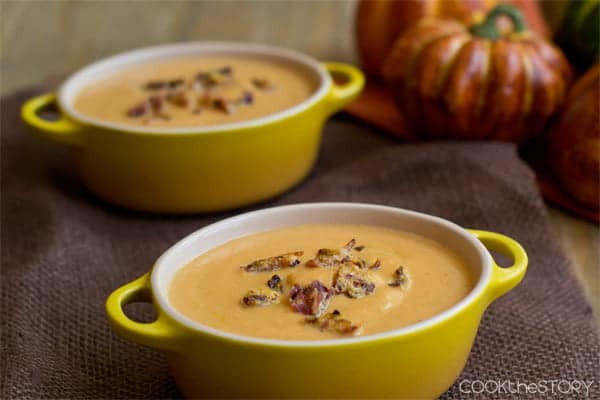 One of my favorite dishes was a butternut squash soup. It was such a pretty orange color and so luscious. I kept tasting it trying to figure out what the flavors were. I couldn’t pick them out exactly. I finally asked the cook and he said it was butternut squash, coconut milk and basil. Ohhhhh. Of course that tasted good. And of course I tried making it as soon as I got home! 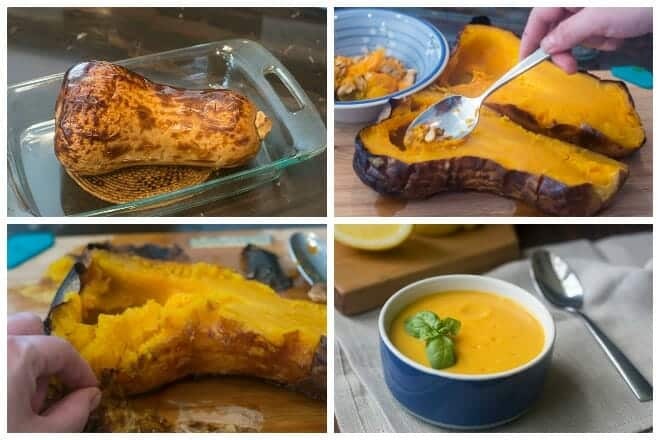 To make this soup I roasted a whole butternut squash. As in, I roasted it while it was still whole, like this. 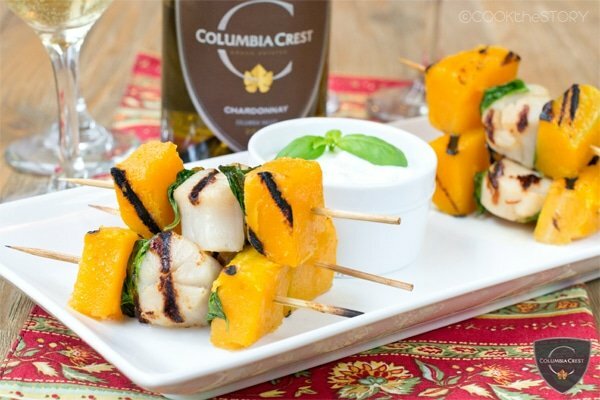 This is the easiest way to cook a butternut squash, hands down. It also gets you a bit of caramelization flavor. You can, however, cook the squash other ways. Peeling it, cubing it, and then simmering it in water until tender and then draining it would be my second choice. Then you puree together the rest of the ingredients, heat it up and dig in. Note: The recipe made at the retreat had ghee in it. Ghee is used a lot in Ayurvedic cooking. It’s made from butter though so it’s not vegan. (Note though that many people with lactose intolerances are able to have ghee. Learn about this here). If you want to make this soup vegan, use a cooking oil like olive oil instead of ghee and add a drop or two of sesame oil. The sesame gives you some of the nutty flavor that ghee is known for but it’s powerful so don’t use very much. I’ve given both vegan and ghee versions of the soup below. 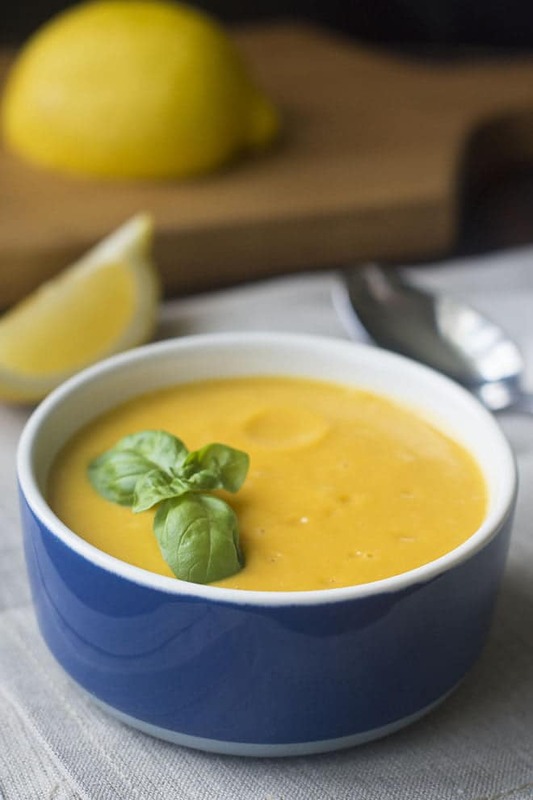 For vegan butternut squash soup, use olive oil and sesame oil instead of ghee. The amounts are listed in the ingredient list for both the vegan and non-vegan versions. 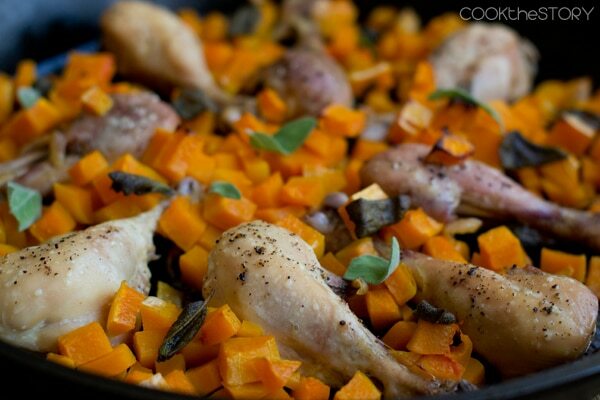 Once the squash is cooked, heat the ghee or oils in a small skillet over medium heat. Add the onion and saute until softened, 2-3 minutes. Put the squash, onion, basil leaves, coconut milk, 2 tablespoons of maple syrup, 1 teaspoon of salt and sriracha into a heavy-duty blender (this is the kind of blender that I use) or a food processor. Puree until smooth. (Alternately, you can put all the ingredients into a pot and use an immersion blender to puree it until smooth). Transfer the mixture to a large sauce pan and heat over medium, stirring occasionally, until steamy hot but not boiling. Remove from heat. Add the lemon juice. Stir. Taste. Add more salt and maple syrup if desired. *1 whole 3 lb. squash is equivalent to about 4 cups of cubed raw squash. This post contains Amazon affiliate links meaning that if you click on one and then buy something I receive a small commission. This is at no additional charge to you. All opinions are mine and are honest.